From Daytona Beach we made a road trip south to Miami for a couple of days to check out the Miami boat shows. 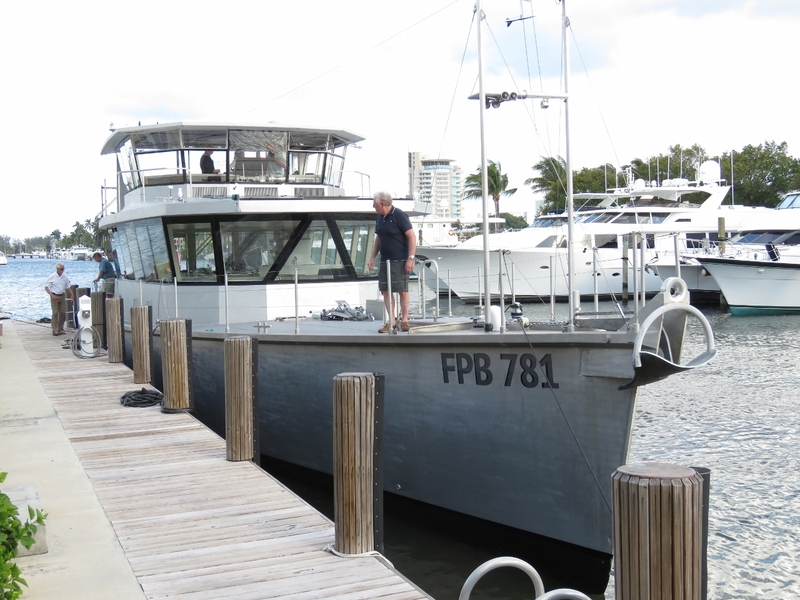 While there we spent some time at sea on FBP 781 Cochise, toured the new Ranger Tug R-29 CB, and also checked out Nordhavn 92 Rest Assured. On Cochise today were, from left-to-right, Bill Parlatore, Linda and Steve Dashew, ourselves, and Scott and Mary Flanders. Jeff Merrill, who sold originally sold us Dirona and is founder of Jeff Merrill Yacht Sales, was also on board and took this picture. Bill is the founder of PassageMaker Magazine and currently explores the cruising lifestyle at Following Seas. 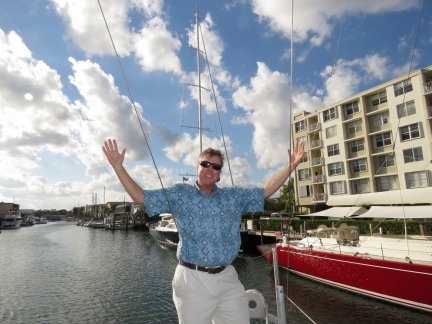 Steve and Linda Dashew are well-known cruisers, authors, boat designers, boat builders and explorers. 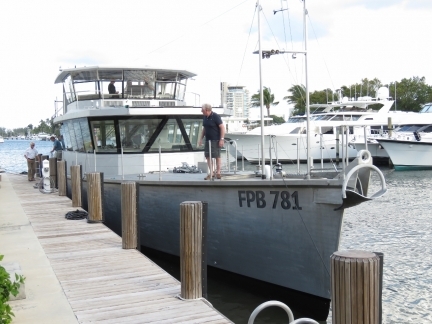 They have spent much of their lives cruising the world in boats they designed and built, the latest being the FPB (Functional Power Boat) series of which Cochise is a member. They share their passion and learnings at SetSail.com. 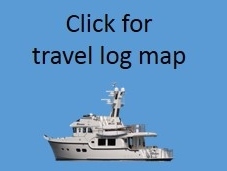 Scott and Mary Flanders circumnavigated in their Nordhavn 46 Egret and documented their experiences in widely-read Voyage of Egret. 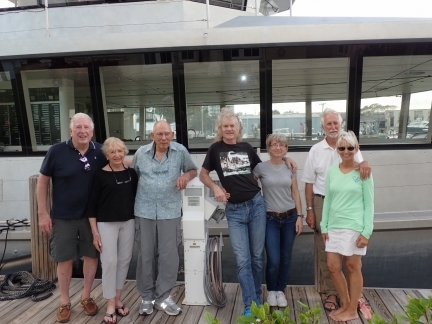 The Flanders are long-time friends of Steve and Linda and just happened to be staying on board Cochise for a couple of days when we visited. 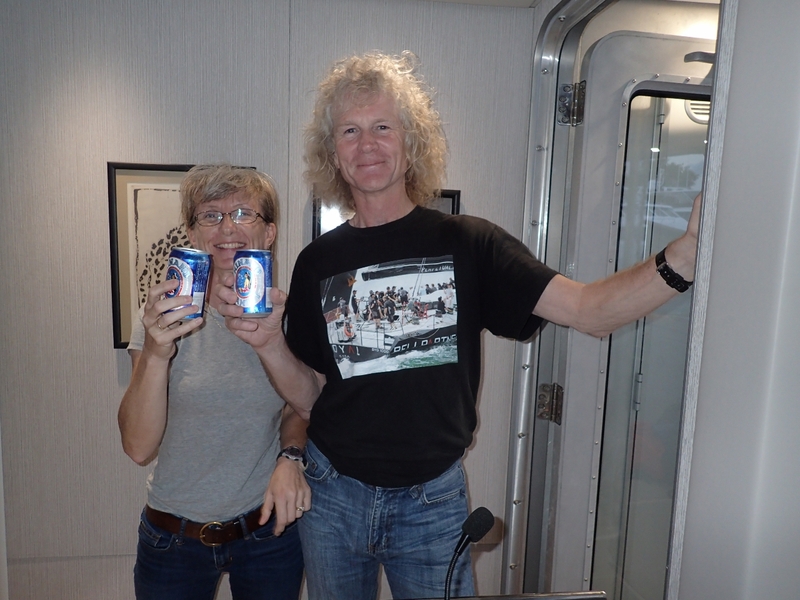 Coincidentally, we saw Egret a few weeks earlier in Brunswick, GA.
We first met Bill Parlatore over a decade ago at Trawler Fest in Poulsbo, WA and we’ve written articles for him when he was editor of PassageMaker Magazine. We first met Steve and Linda many years ago, also at a Poulsbo Trawler Fest, at a session they gave while attending on their previous boat Wind Horse. We’ve talked so frequently with the Flanders over email that it was a surprise to realize that we’d never had an opportunity to meet in person. We had a wonderful afternoon with them all. We enjoyed getting to know Steve and Linda better, and it was great to see Bill again and to finally meet Scott and Mary in person. 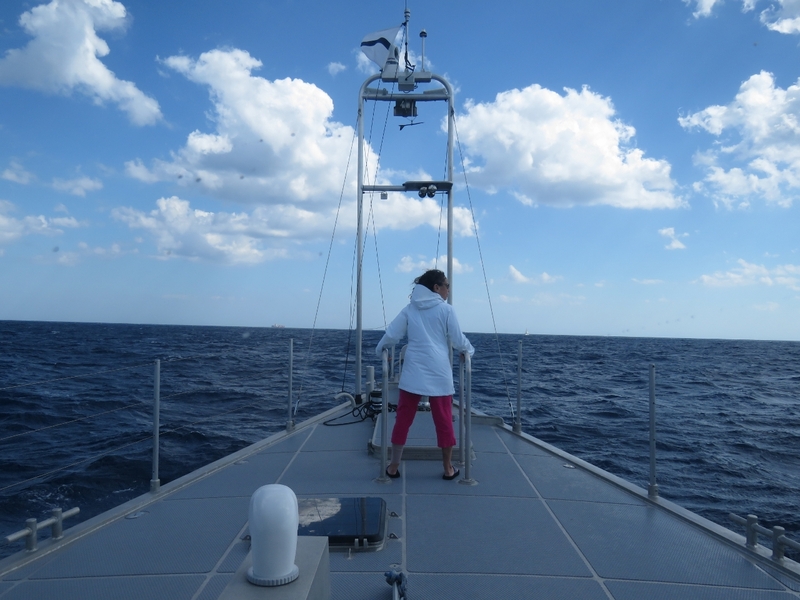 In 25-knot winds and tight chop, Cochise is an amazingly dry ride, with hardly any spray on the bow. Riding forward is Pam Wall, a circumnavigator and member of the FPB team. Jeff Merrill on the bow showing clearance while Steve turns the 78ft boat in a channel that looked about 80ft wide, with 20 knots of wind. Steve is an incredibly experienced helmsman and Cochise is very maneuverable. The view from our Miami Beach Resort hotel window to Yachts Miami Beach, one of two boat shows taking place in Miami this week. 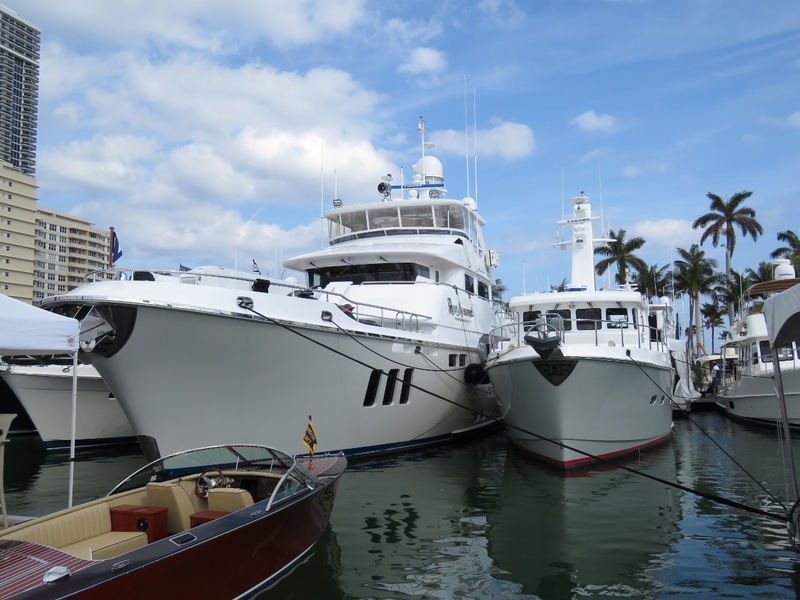 We’ll be heading a little south this morning to the Miami International Boat show, then returning for the afternoon to Yachts Miami Beach. At the Miami Boat Show. 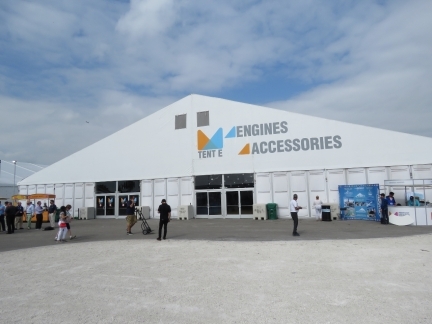 We spent a lot of time in the Engine and Accessories tent. For lovers of technology and high-output racing engines, offshore powerboat racing is hard to beat. 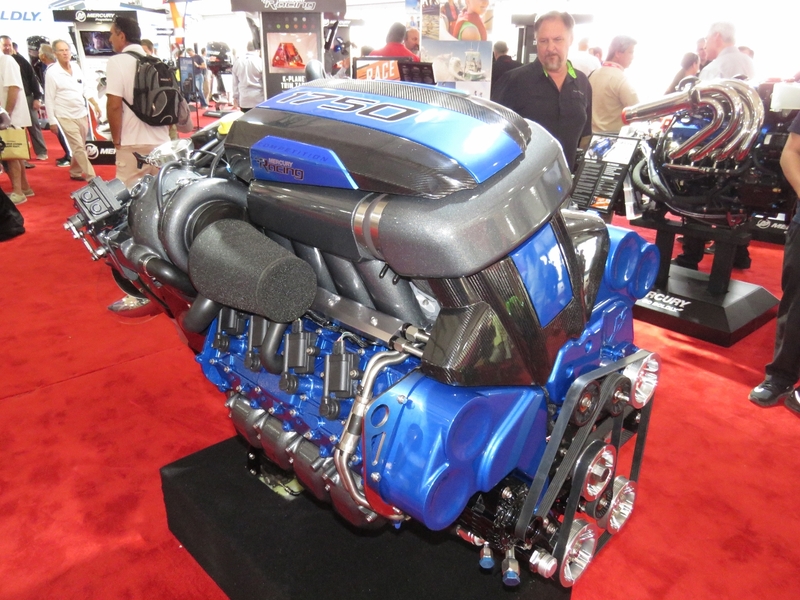 This is the most powerful engine produced by Mercury racing. This 9 liter (550 CID), twin turbocharged monster is putting out an incredible 1,750 hp. 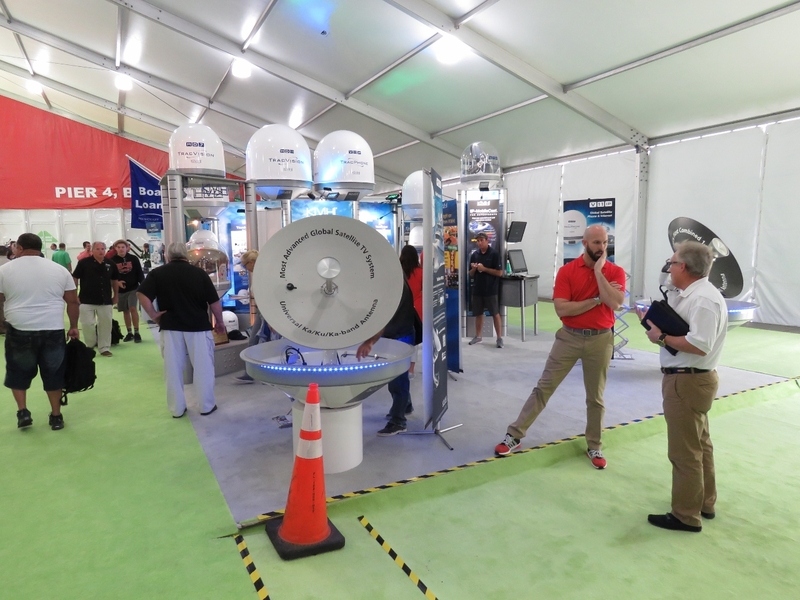 We stopped by to say hello to folks from our favorite satellite provider, KVH Industries, in their booth at the Miami boat show. Seven Marine bills their product as “the most powerful outboard on the planet”. They turn a 6.2L Cadillac V8 on end and somehow stuff it into an outboard motor case. We saw at least two boats at the boat show with four Seven Marine 627s for a total of 2508HP. That’s a lot of ponies. 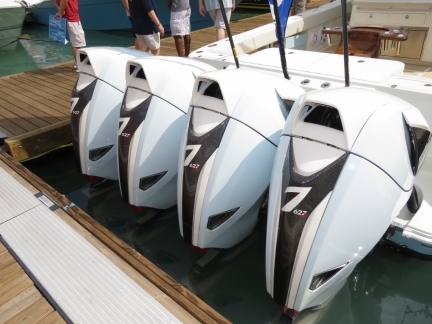 Q: Why put 4 627-HP outboards on the back of a center-console? A: Because five wouldn’t fit. We spent ages touring a Ranger Tug R-29 CB at the boat show. 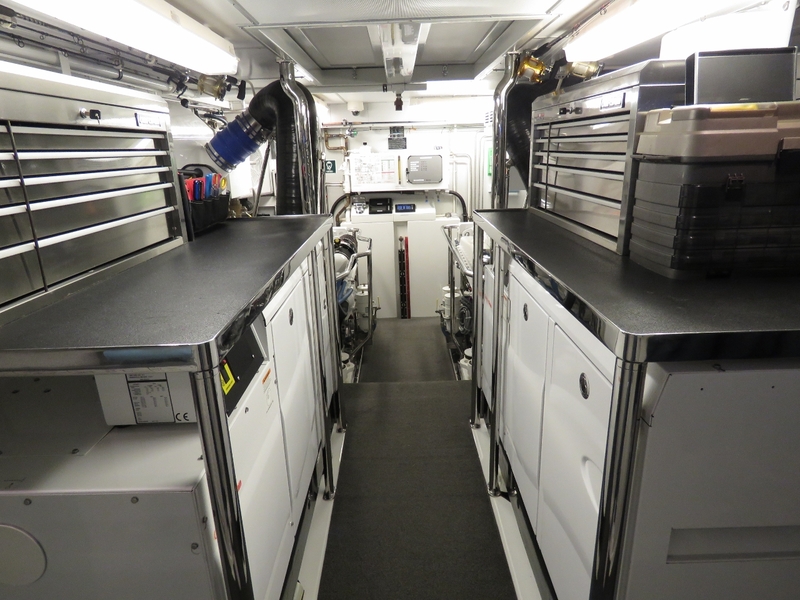 The trailerable Rangers are wonderfully-executed boats with amazing attention to comfort and space utilization. We’d not sell Dirona, but would like to spend a season or two cruising the ICW and doing the Great Loop on a faster boat with less air and water draft. The Ranger R-29 CB looks like a pretty good candidate. We really fell in love with that boat. The Yachts Miami Beach show was focused primarily on large yachts, with many vendors having appointment-only areas for customers. 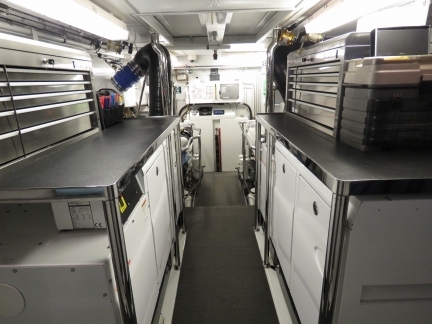 This high-tech Evo 43 caught our attention with slide-out sides. 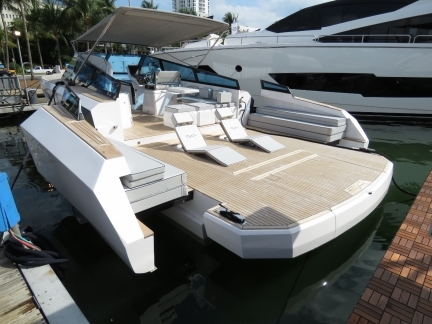 It’s a pretty innovative design and we’re expecting slide-outs are going to open up a lot of new possibilities in boat design just as they have in the recreational vehicle industry. 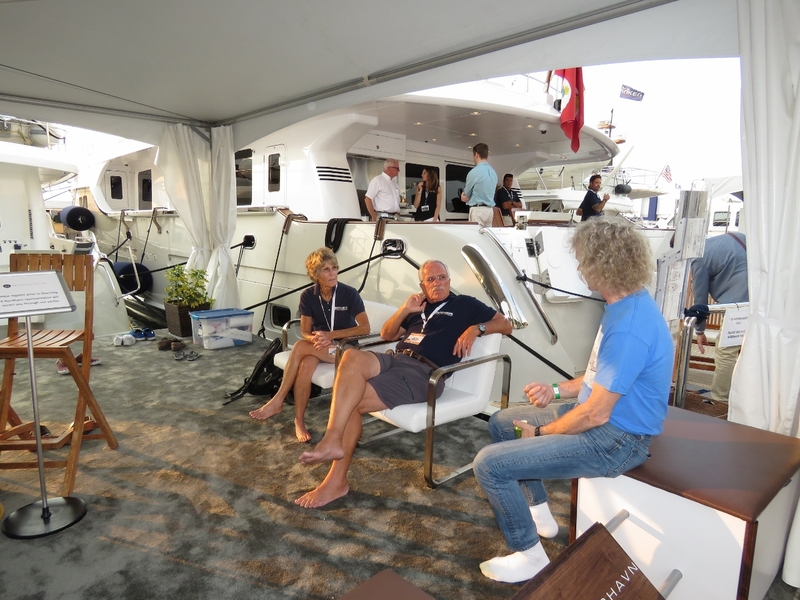 Nordhavn 92 Rest Assured and Nordhavn 52 Stella Maris at the Yachts Miami Beach show. 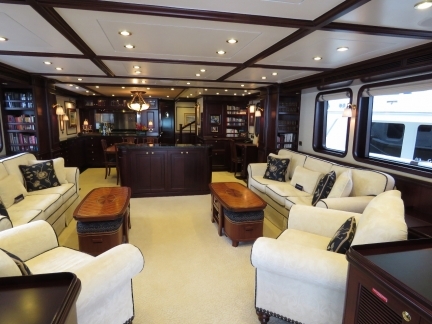 We toured Nordhavn 92 Rest Assured. It’s an incredibly beautiful boat. 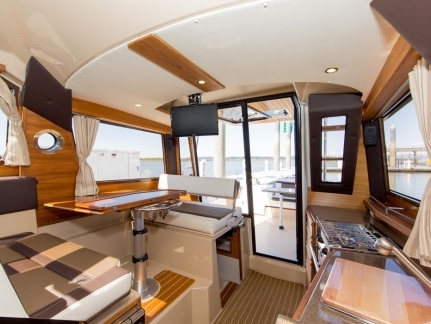 The engine room in Nordhavn 92 Rest Assured is amazing. We eventually dragged ourselves out after a good half-hour. We haven’t seen Stella Maris owners Bruce & Pam Harris since we were both moored at Soverel Harbor Marina in Palm Beach a year ago. We’ve stayed in touch, but it was great see them in person again and catch up. 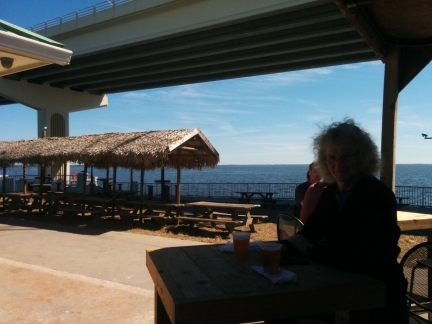 On our drive back from Miami to Daytona Beach, we stopped off at Crackerjacks for a great lunch in an awesome venue right almost in the middle of the Indian River and the ICW. We especially enjoyed the view to the Vehicle Assembly Building and the launch pads at the Kennedy Space Center (just barely out of sight behind the thatched roofs). Like your tip, and experiences, of using the shoulder seasons to cruise the eastern seaboard. Another big plus is not worrying about those boaters so glued to their electronics panel that they forget to actually look out the window while underway. Yes, we find the shoulder season much more enjoyable. Less crowds, easier to find anchorage, easier to find moorage, easier to get a spot at a restaurant, and less waiting for everything. Hi James, Looks like you and Jennifer have been having a great time; especially hooking up with old friends. Thanks too for your discussion about electronics in the Dreamer’s group. Much appreciated learning more about staying connected. Yes, we are having a great time up and down the eastern seaboard. The marina’s are surprisingly expensive in many of the larger centers like Boston probably due to the shorter season and high demand in the summer but, exploring the shoulder seasons either later in the year or earlier than most boaters in the area has been working out very well. Less expensive and no crowds.